The Psalms tell us to wait patiently on the Lord. I used to read that as a kind of passive-aggressive move on God’s part. Here I was, desperate for God, waiting and praying with all of my heart. Would it kill him to show up when I pray? After learning about and practicing contemplative prayer, I realized I had everything completely backwards. God has been waiting for us all along, but we are often too distracted, impatient, or fearful to be present for him. In addition, a “present God” may not bring about the emotions and experiences we expect. God’s love is here and constant, and there is nothing I can do or feel to change that reality. I can ignore it or obstruct it, but I can’t stop it. Learning to pray isn’t about turning on the tap of God’s love. Rather, learning to pray is about training ourselves to be present for the love of God that is already at work in our lives. Evangelical anxiety tells us that prayer isn’t working because there must be something wrong with us. Evangelical anxiety focuses on results and progress, but God is more concerned about loving presence. Contemplative prayer has taught me that God’s love is present and that I need only seek God in order to pray. I may have an epiphany, but I most likely will not. God’s love is steady and constant, and many days I have to settle for taking that on faith. Focusing on my feelings and experiences have been my greatest barriers to contemplative prayer. I have had to completely shut down my anxious evangelical tendency toward measuring and proving my spiritual vitality and worth. François Fénelon wrote, “How will you go on to maturity if you are always seeking the consolation of feeling the presence of God with you? To seek pleasure and to ignore the cross will not get you very far. You will soon be trapped in the pursuit of spiritual pleasures” (100 Days in the Secret Place, 11). The journey into contemplative prayer calls on us to think differently of God and of ourselves. Very little depends on us. 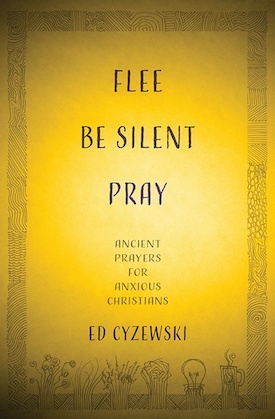 The spiritual “work” we do in contemplative prayer is very different from the spirituality of many evangelicals who are bogged down with lists of beliefs, practices, and activities that we must do to pursue holiness or the presence of God. We’re never doing enough to win God’s love or to achieve any kind of lasting life transformation. How could we? God’s love is already ours, and until we learn how to simply receive it, we’ll get stuck in an anxious rut of performance, failure, and struggle. The first step in many spiritual practices such as the Examen and centering prayer is a simple acknowledgement that God is present. That is so very different from my assumptions as an evangelical Christian who used phrases like, “I’m waiting for God to show up.” Theologically I could explain divine omnipotence, but practically, I struggled to believe that God was truly present with me and, most importantly, loving me right in that moment without preconditions. This is the true prayer of a little child in the Kingdom. If you can only call out, “Jesus, Jesus, Jesus,” in faith and reliance, then you can pray. My own pride and hopes for spiritual advancement kept me from seeing how badly I needed to become like a little child in prayer. Contemplative prayer has proven most beneficial for me because it addressed my reliance on having the right questions and finding the right answers to those questions. In God, we don’t always have an assurance that our questions will be answered to our satisfaction or that we’ll even find the right questions to ask.